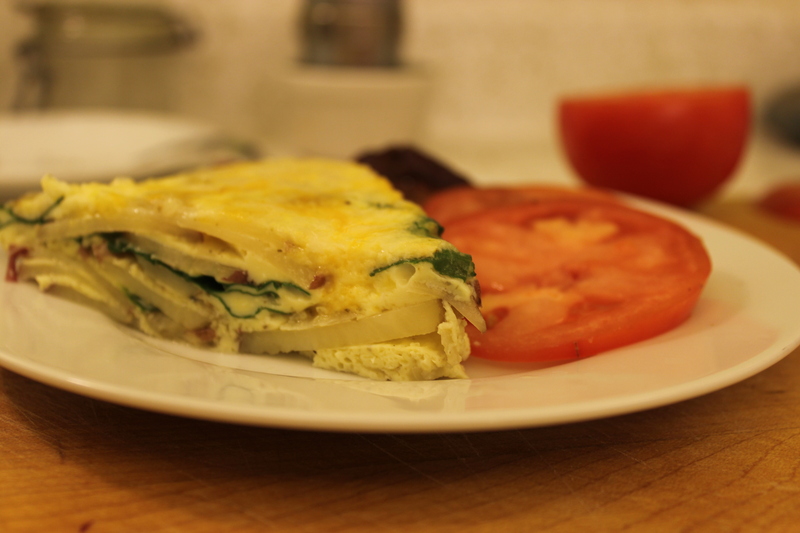 Frittata, it does it all, breakfast, lunch dinner, or even a midnight snack. This is the type of recipe that really covers all the bases, hot on a plate, or cold standing over the counter, this is one satisfying dish. Once you get the basics down, you can make whatever happens to be in the fridge, into a Frittata. For me, this recipe generally starts as breakfast, then a quick and light, post work snack, especially at the end of dual job day. Other times if you simply pair it up with a salad, it makes a great lunch, or light dinner. The best part of Frittata, it can be anything you want it to be, loaded with veggies, packed with meat, or maybe just cheese, there really aren’t many rules. I make mine start to finish in a skillet, again the versatility of the Frittata shines through here, you could opt to transfer to a Quiche dish or pie plate, after cooking the potatoes and onion. Using the skillet makes it a one pot wonder for me. 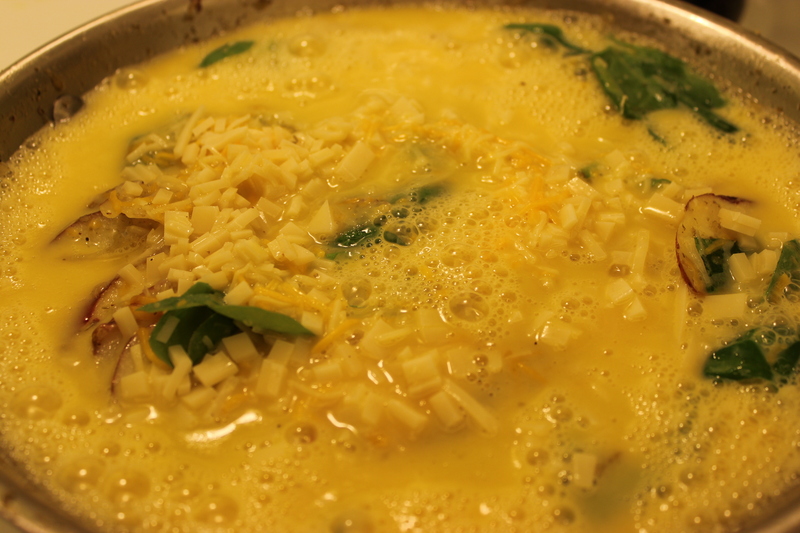 After it has cooled a bit, a loosened Frittata will slide easily out of my stainless steel, All Clad skillet. If you are a non-stick kind of cook, you know it will slip out of that pan, with the most gentle of nudging. To me the real secret to this Frittata, is being very generous with tasty, high quality, olive oil. I continually add to the skillet as I go along, yes I use copious amounts of olive oil for this. A measurement that I like to call a sploosh, somewhere between a splash and a slosh. Yes Shelley, now that I have officially defined it, it is now a technical term. Which is another reason to be sure to use a great tasting extra virgin, olive oil. Read the label, if it says Pure or Light, or anything but Extra or Virgin, that is an oil that has been refined. All true Extra Virgin olive has been cold pressed, whether it says that, or not. Buy local if you can, if not do some homework, you will be able to find the oil, that satisfies your palate. The wonder of this recipe is the endless possibilities, mix match, whatever you like, there are no steadfast rules. 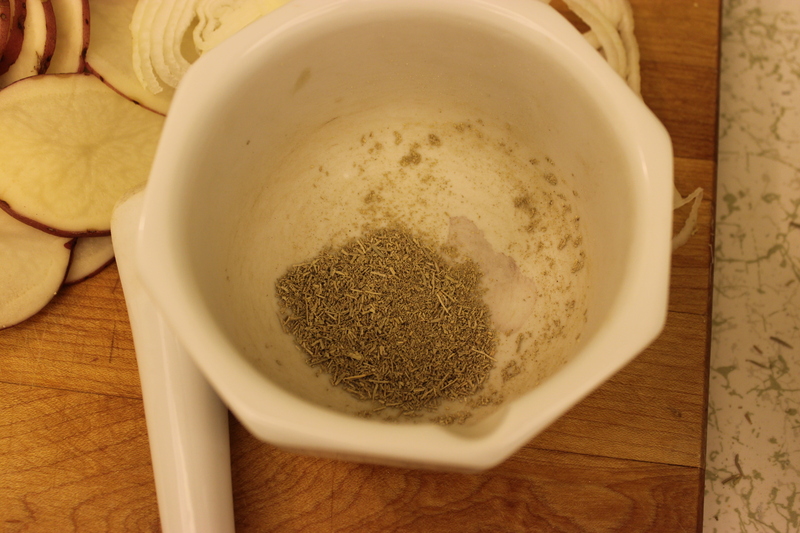 You can make this in any size skillet, just adapting the ingredients to fit the vessel. Today I used a 10 inch skillet, you can change the volume very simply, I would do 3 eggs in an 8 inch, most likely 8 eggs for a 12 inch skillet. 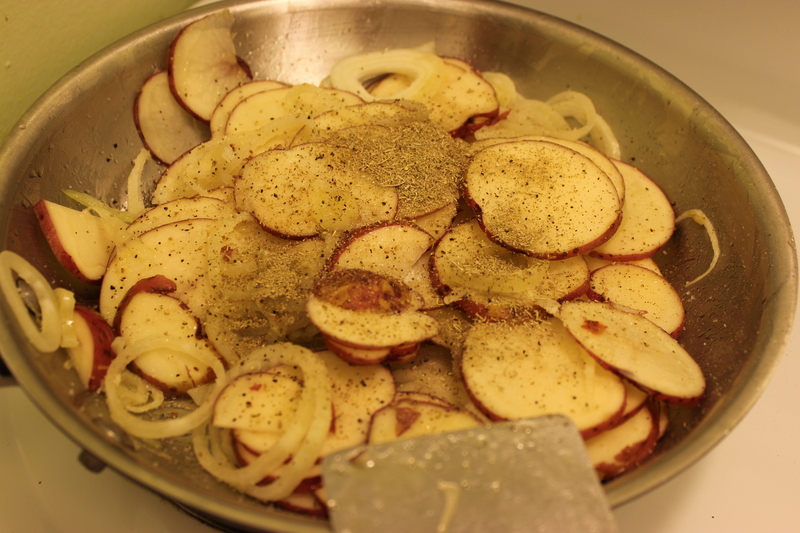 The potato amount, I would adjust depending on how many other vegetables, or other options I would be adding. 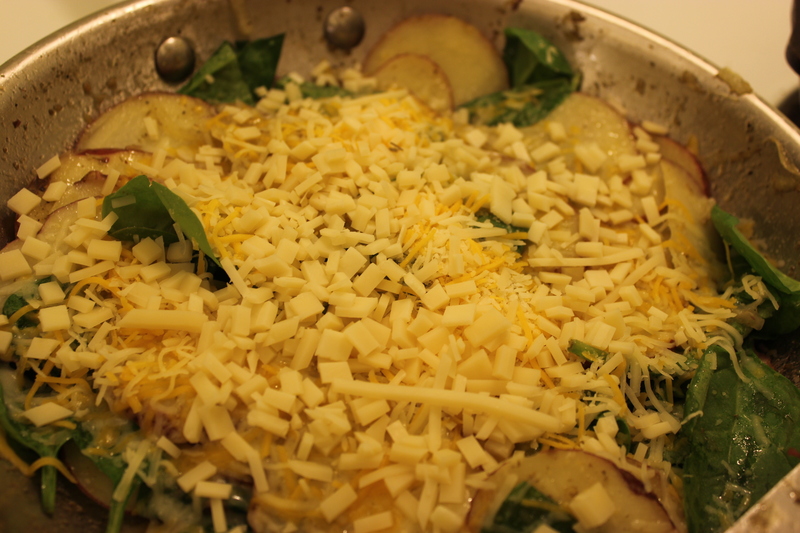 The potatoes provide a sturdy foundation for the eggs and cheese, so keep that in mind. Thin skinned potatoes do not need to be peeled, I like the color red potatoes add. 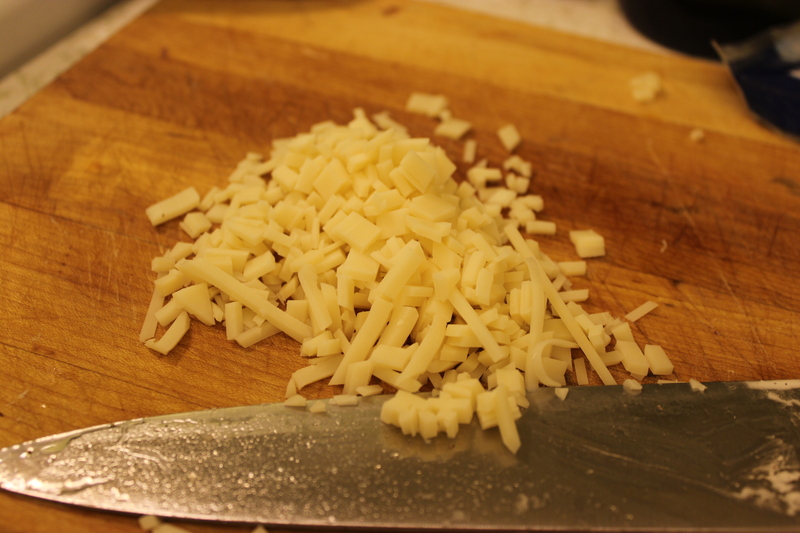 The cheese is whatever you have or want, today was a mix of cheddar and few slices of swiss that I diced. 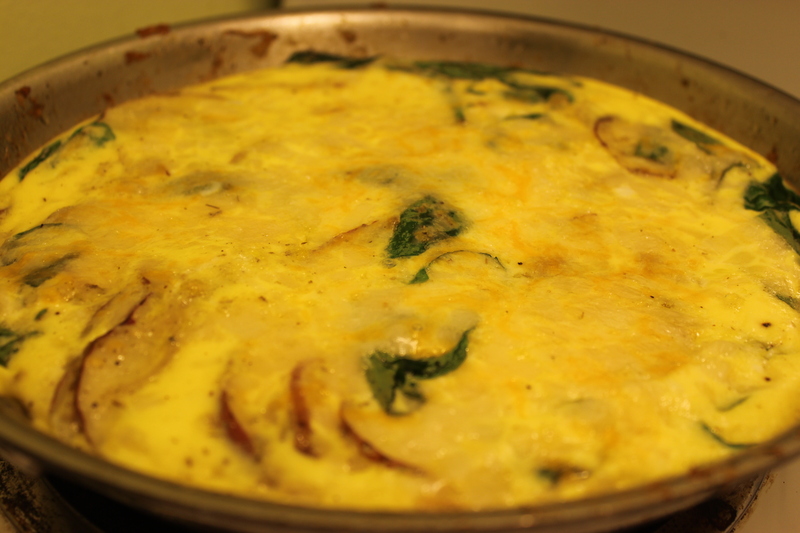 Again, the Frittata can be whatever you want it to be, and seriously how often does life hand you that choice. In warmed skillet over medium heat, add olive oil to create a thin coat on bottom of 10”skillet. 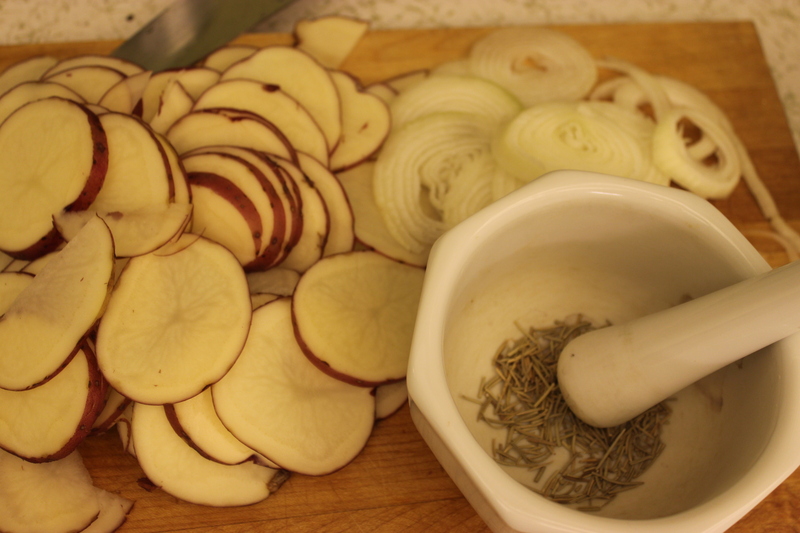 Add potatoes, onion, rosemary, salt and pepper, stirring occasionally, cook until onions become translucent. Adding olive oil to skillet as needed about a tablespoon at time, as it is absorbed. Whisk together egg and milk until frothy. Add water to skillet, cover skillet for about 5 minutes, until water is mostly absorbed. This steaming process quickens the potato cooking time. 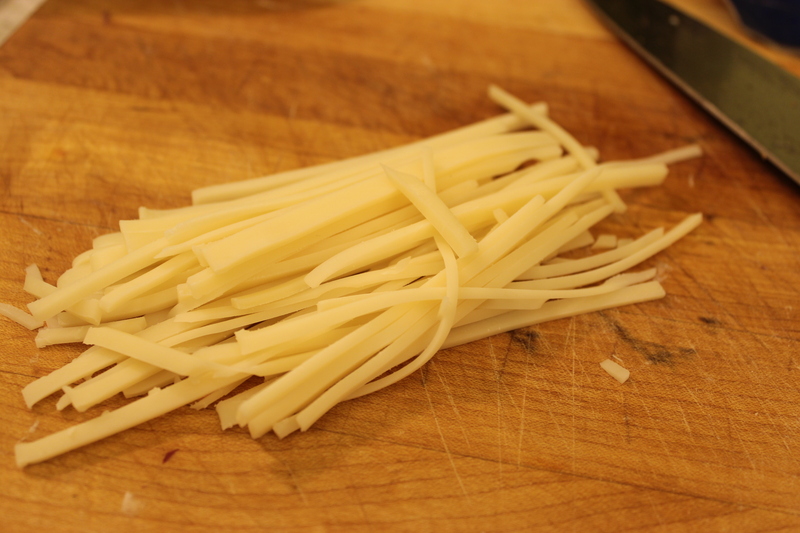 Remove from heat, drizzle with olive oil, add any extra ingredients at this point. 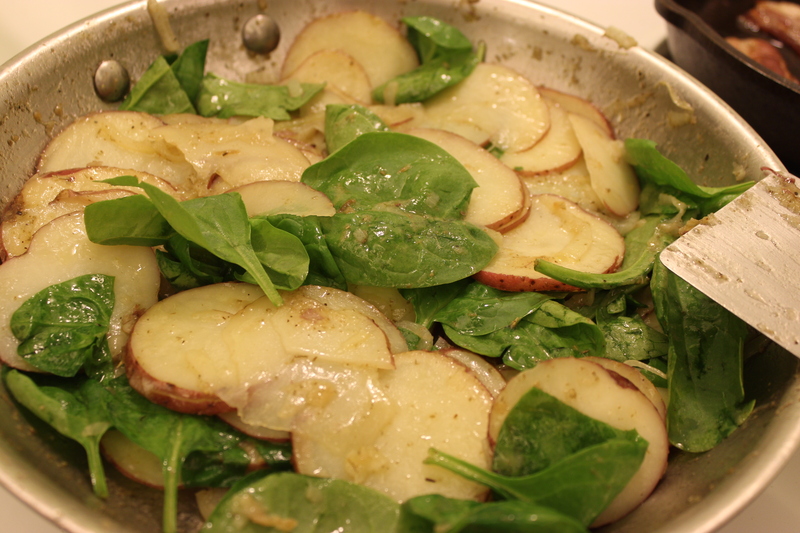 Today I used baby spinach, gently tuck your add ins around the potato and onion mixture. Sprinkle cheese over everything, then pour in egg mixture, nudge the potato mixture a few times to ensure the eggs surround the ingredients. Bake for 20 minutes, at 350⁰. Allow to cool for a few minutes, either slice and serve from pan, loosen, slide out on to serving dish. That would be very interesting to try. We had a babysitter, her name was Anna Maria, she would eat leftover spaghetti for breakfast, with milk and sugar on it. Clearly something I never forgot, no matter how long ago it was. My Dad would do, almost the same thing with rice, only after dinner. He would have milk, sugar, and raisins, it was like a quick rice pudding. Thanks for stopping by! oh that sounds awful! but who knows? i should try it!!! 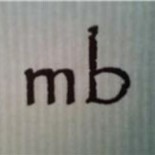 This entry was posted on June 21, 2015 by mb in Appetizers & Snacks, Breakfast, Leftovers, Sides, Vegetables and tagged Breakfast, cheese, cooking, Dinner, food, Lunch, recipes, snacks.